Hi Joel. Thanks for working on this. I have recently noticed that OH will stop getting any data from my thermostats for days at a time. Like right now it hasn’t gotten an update since Aug.10. The behavior is the data will get stuck on one set of values and never update again. In the past when I saw this I would restart OH and I started getting data again. I will install your latest jar and see if that behavior changes as well as whether the humidity stops bouncing around. The new jar worked great for the past five days. Temps and humidity all reporting in within seconds in the right units. However, the data feed has now stopped. 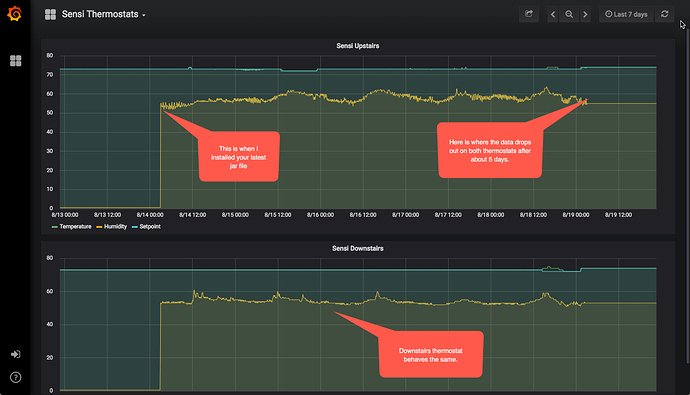 Here is a screenshot from my Grafana. How can I begin helping troubleshoot? Do you see any wink related error messages that show up in the log around the time it stops? I’m just getting started in this. I’ve downloaded OpenHab 2.3.0 Stable Runtime, installed on Win 10 using the instructions, grabbed the latest org.openhab.binding.wink-2.4.0-SNAPSHOT.jar (commit 98cec76) and added to “addons” folder, got a token via openhab-authservice.herokuapp.com, configured the binding for “delegated” and added my token. I add the Wink 2 Hub manually and shows “online” and i don’t get any discovery notifications, either manually or by scanning the binding. I am “logged in” to Wink via herokuapp this whole time. Does that make a difference? So, what information can I offer to help diagnose this problem? I have three Lutron Caseta Dimmers added to the Wink Hub, FYI. 2018-09-12 21:08:11.145 [WARN ] [okhttp3.OkHttpClient                ] - A connection to https://myopenhab.org/ was leaked. Did you forget to close a response body? 2018-09-12 21:08:38.756 [WARN ] [okhttp3.OkHttpClient                ] - A connection to https://myopenhab.org/ was leaked. Did you forget to close a response body? It looks like somehow your system is missing the org.glassfish.jersey.client.JerseyClientBuilder dependency. I’m not sure exactly how to get it added at this point, but I’ll do some looking around. One thing you could try is installing a binding that has this same dependency thru paper ui. It looks like the nest binding has this same dependency. Try installing the nest binding and then try dropping in the wink binding to the addon folder again. I misunderstood the readme and did not add the wink.cfg to the conf/services directory. I got it to see the dimmers already added to the Wink hub. OK, So I decided to start fresh. Still not working. I removed the current openhab install and re-installed to a new directory. I added the WINK binding and then configured for “delegated” mode. Added the Hub manually and then searched. Here is the log file after performing the search from startup to shutdown of openhab(I did two searches). OK, got the control of dimmers via openhab. When I adjust the settings via openhab, I see it reflected in the Wink app on my phone. However, if I adjust settings in the Wink App, they are not updated in openhab. Should openhab update after adjusting in Wink app? It should update. Maybe not immediately, but it should. The longest I’ve seen is 5 min. Are there any errors in your logs, maybe search for pubnub in your log and see if any error messages could tell us some clues. So, it appears to be updating in the logs, but not the Paper UI. I turned it off via the Wink app a couple seconds after the app updated with the status, but no change shown in Paper UI. I do not see any issues with the JSON, however it appears that your logging does not have the debug messages enabled. Can you turn on debug logging and send the log messages again please? I found how to enable debug logging in this thread. Another thought I had while looking at the code is that there are two channels for the light. A lightlevel channel and a lightstate channel. The logs are pointing out that your item on PaperUi is hooked up to the lightlevel channel. The lightlevel channel watches the ‘brightness’ param from the JSON logs. When you made the changes, the ‘powered’ param changed, but the ‘brightness’ did not. The ‘powered’ param from the JSON is monitored by the lightstate channel. It might be worth trying to create two items, one for each channel, and see if one or the other channels receive an update after making changes on the wink app. Then we may be able to determine what needs to change so the items will work the way you would expect. Unfortunately, I do not have any dimmers or an actual wink hub to try any of this out on. I use the wink binding for my Sensi thermostat, which does not require a physical hub. Send some logs with debug logging turned on and with the multiple items added to your PaperUi and I’ll look thru the code and try to figure out what is going on here. I turned debug logging on and have more outputs in the openhab.log file. I am still noticing a disconnect, but it will update, just not properly. Sometimes the State will update, other times the 0-100 dimmer value, other times the dimmer on/off will update. So, give me some to play around and put this together in a manner that makes sense. I’ll report back with either some logs or if I find something poking through the code and debug logs. Do I need to have a real Wink hub in order to use this add-on? Do I need to create a wink account first BEFORE setting up the heroku service? You do not need a physical wink hub. You do need a wink account before heroku. Thanks Joel. I got it working after signing up for a Wink acct using the Wink app. Could I change the refresh rate? If yes, where? Unfortunately, the refresh period is hardcoded to 5 min. Hi new here to this thread. I’m looking for some help to get access to the current temp and humidity values from my sensi device. I have them up and operating with the wink jar and auth info. I want to dump the current temp and humidity for each thermostat to a file for use by some other scripts that I have running. I have looked at OH documentation but I very new to OH and i don’t see an easy way. When this happens, my temperature items stop updating. The only way I can get out of this is to restart the OH service. Do you know why this error? Is there a way to detect this problem so that I can write a rule to restart the OH service automatically? I think this error means that the connection to api.wink.com failed. Just before the error, a debug message should be present in your log if you have debug turned on that starts with "Doing Get: ". Can you send what that debug line shows? I do not know of a way to detect this failure and restart the OH service, however, there has to be a way to properly handle and recover from this type of exception. I will work on that. Unfortunately, I did not have DEBUG turned on. What package(s) should I monitor?